Weather conditions on Saturday were great for racing: sunny skies, temperatures in the upper 60s, and a steady tailwind from the north at 10-15 mph. 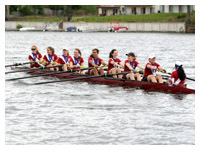 The girls first boat, rowing in the M. Catherine Gilmartin, had (from bow to cox) Allison Courtin ’08, Rory Erickson-Kulas ’08, Katrina Regan ’08, Erin Metcalf ’09, Katherine Dyke ’08, Lizzy McDermott ’08, Cathy McDermott ’08, Lynn Ann Forrester ’08, and Alyssa Murray ’08. The boat had a “phenomenal row” in the heat, “some of the best rowing all season” according to Courtin. After an aggressive first 500 meters, Murray called the rating down and did not sprint–the boat finished the race at a 31 and 13 seconds ahead of second place Boston Latin. In the final, the boat got off the line behind Andover and St. Paul’s after a mediocre start and unsteady settle. After a significant move 800 meters in, the Gilmartin caught up to and passed St. Paul’s and Andover, eventually opening up the lead in their best sprint this season to beat St. Paul’s by 4 seconds and Andover by 6 seconds. In addition to winning gold, the Gilmartin’s 4:46.6 finish broke Kent’s 12-year-old 4:48.7 course record, as well as earning a coveted “three-peat”: three wins by the girls varsity eight in consecutive years. 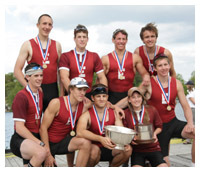 The boys first boat, rowing in the Titus, had (from bow to cox) Tim Moore ’08, Vaughan Coder ’08, Mario Barosevcic ’08, Ryan Jones ’09, Chris Jones ’08, Andrew Safir ’08, Ian Winthrop ’08, Luke Thoms ’08, and Alex Manfull ’09. The boat was “a little nervous going into the heat,” and “definitely felt tense for the first 800 meters–a little rushed on the slide” according to Winthrop. After the Titus gained a comfortable lead on the field, Manfull called the rating down. This shift actually gave the boat more speed, as the rowers gained much more “length and relaxation in the stroke,” and the Titus crossed the finish line at a 29. The final was much closer. The start was somewhat shaky off the line with some rush on the recovery during the settle. By the end of the settle, Andover was a few seats up on Exeter. After calling a few power 5s and 10s, the Titus was head-to-head with Andover at the 500 meter mark. During the middle 500, Exeter slowly opened the margin, until an explosive power 10 at the 1000 meter mark broke open the gap significantly. Andover sprinted early, “around 400 to go,” Manfull called the Titus’ sprint early in response, bringing the rating up three times, going on to win by 2 seconds over Andover and 6 seconds over Kent. This is the first gold medal the boys varsity eight has had since 2002, and the first undefeated season since the legendary crew of 1996 that went on to take gold at Nationals. The girls second boat, rowing in the Anja, had (from bow to cox) Hannah Ward ’08, Madison Gilmore ’08, Abagail Loucks ’10, Rebecca Kisner ’08, Tamar Nisbett ’10, Katie DeAngelis ’09, Arian Wakeman ’09, Nancy McKinstry ’08, and Katie Courtin ’09. The boat felt nervous going into the heat, and had a somewhat rocky start off the line. The boat recovered quickly and steadily opened their lead until they had open water on the field after the first 500. Courtin called the rating down and the Anja cruised to a comfortable 7 second win. The still undefeated boat headed into the final even more nervous: the 2006 and 2007 girls second eights were similarly undefeated but upset in their grand final, taking silver both years. This anxiety showed in the final as the Anja got off to an even more unsteady start. After the high strokes, the eight was 4 seats back on Andover. Courtin called a move and the boat slowly crept back on Andover, until they were even at the 500 meter mark. In the middle 500, the Anja steadily opened their lead further until, after a number of impressive moves, gained open water before the 1000 meter mark. The boat cruised into the sprint to win by a tremendous 7 second margin and finish their season totally undefeated. The boys third boat, rowing in the Philip A. Lyster, had (from bow to cox) Jamie Ashton ’10, Lane Pertusi ’09, Tony Baker ’11, Gar Ditz ’10, Ian Tibbetts ’10, Peter Shu ’09, Josh Sans ’09, Paul Nagao ’09, and Clancey Stahr ’11. The boat had a solid start in their morning heat, though the field quickly separated with Kent in front, Exeter in second, and Brunswick in third. Stahr called the rating down after the first 500, and the boat cruised to a comfortable second-place finish. During the final, the boat got off to a slow start: down 2 to 3 seats after the high strokes. After Stahr called the settle, the rating remained unsteady. Andover, St. John’s and Kent lead the field, with Exeter, Salisbury and Brunswick close behind. With 400 meters to go, Andover, in the lane next to Exeter, caught two massive crabs, forcing the Lyster to swerve to avoid them. By the time Andover recovered, Exeter had gained nearly a length and was in third place. With only a few strokes remaining in the sprint, Exeter was a half length ahead of Andover and Salisbury. Suddenly, someone on the Lyster caught a crab, slowing the eight down enough so that Andover and Salisbury both caught up, Exeter finishing in fifth overall. Overall, a major congratulations to the entire program on another very successful spring season. As the boys and girls first boats both qualified to attend the USRowing Youth National Championship outside of Cincinnati, Ohio, another news post will be published later this week detailing their decision to attend the regatta. A short slide show depicting the entire season is also in the works. Update: Race photos are now available! Check them out below. Please note that these are a small fraction (370/2252) of the higher quality (one-ninth size) originals optimized for internet viewing. If you are looking for higher quality copies (for prints, cropping, etc.) please do not hesitate to e-mail me and I can easily upload any originals you are looking for.